Bonnie Hacking leads the breakfast workshop on leadership. Bonnie Hacking is Enterprise Adviser in the Careers Centre at the University of St Andrews and teaches in the School of Management. She was the speaker at the January 2017 breakfast meeting of the Club. Bonnie is passionate about people and provides skills training, coaching and advice to entrepreneurs. She’s worked with entrepreneurs who’ve built children’s homes in India, sold bicycles online, provided temporary summer storage for students, manufactured food items and a whole variety of web-based ventures. Bonnie is also a Director with Enterprise Educators UK and University Adviser with Enactus UK. Prior to joining the university, Bonnie was Management Development Officer for Oxfordshire County Council and People Programmes Manager for the Unipart Group of Companies. 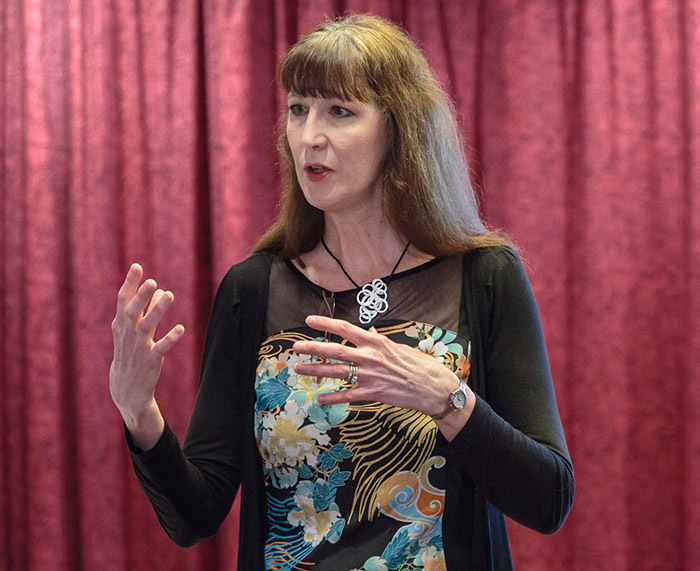 In an interactive workshop involving the audience, Bonnie led Club members and their guests through the importance of leadership, particularly in the uncertain times we face and for SMEs. You can download Bonnie’s Powerpoint presentation here. First, Bonnie asked the participants to consider people they thought have demonstrated exceptional leadership and identify the behaviours, characteristics, skills and traits they have in common before going on to talk about why leadership matters. Bonnie explained that BIS Research Paper 211 “Leadership and Management Skills in SMEs: Measuring Associations with Management Practices and Performance” published in March 2015 looked at the performance effects of a set of leadership and management dimensions in 2,948 SMEs in England with between five and 250 employees. The skill sets most consistently and strongly associated with good management practice and SME performance are entrepreneurship skills and leadership skills. Across all firm types and contexts, the entrepreneurship skills of top managers are positively and significantly associated with turnover and productivity. Leadership and entrepreneurship skills are positively related to strategy formalisation and responsiveness – key drivers of performance and growth. Strategy formalisation is positively associated with turnover while strategy responsiveness is positively associated with firm growth. Best practice strategic management is also related to the implementation of best practices in human resource management (HRM) – which are in turn, positively and significantly associated with turnover and productivity. Skills differences are more important than structural (e.g. industry sector) and contextual factors (e.g. ownership, age and size) for explaining the ‘long tail’ in implementation of best practices. Which businesses can gain most benefit from improved leadership? The overall impact of leadership and management skills on firm performance tend to be particularly strong for firms with between five and 19 employees. The impact of HRM practices on performance is strongest among businesses with between 50 and 99 employees. Bonnie went on to explain the fundamental bases of different leadership theories (Slide 9) and how vision, inspiration and momentum make up the essence of leadership (Slide 10) before discussing the aspects of leadership (Slide 11), how an effective leader uses their skills, qualities and behaviours in the context of the organisation and their staff (Slides 12 and 13) to get results. Bonnie then challenged the participants to consider questions about their own leadership and management practice (Slides 17 to 19) before sharing recommended free online resources to further their learning and development (Slides 20 & 21). Finally, in answering questions, Bonnie said research has shown personal leadership qualities aren’t fixed and can be developed. Also the leadership style used to manage each individual subordinate should vary based on their needs while keeping in mind the need to manage their performance.